Today is the last day of my “Spotlight” Author blog tour with Rave Reviews Book Club. I am excited to be hosted by J.V. Carr. My time in the “Spotlight” has been so wonderful. I thank Rave Reviews Book Club for the honor. Out of nowhere I would be driving to work and start crying as I was about to turn onto the street where my office was located. How many times have you had that feeling deep in the pit of your stomach that tells you that something you are about to do is wrong? To read more of this blog post about that “little voice” in your head, please visit me on J.V. Carr’s blog. 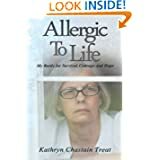 This entry was posted in Allergic to Life: My Battle for Survival, Allergies and Sensitivities, Environmental Illness, Mind and Body and tagged allergic to life, intuition, J. V. Carr, Rave Reviews Book Club, Spotlight Author Blog Tour, That Funny Little Voice in Your Head. Bookmark the permalink. I’ve enjoyed these spotlights immensely! Thank you very much Christine. I have had great fun traveling from blog to blog.